We don’t usually use the word trauma when discussing feeding disorders, but we should. Children who have experienced significant emotional stress during feeding because of GI discomfort, poor oral control, cardio-respiratory issues, or forced feeding are at risk for disordered behavioral responses around feeding for many months (or years) to come. Infants born prematurely exhibit feeding problems due to neurological and respiratory immaturity and the myriad of issues that can arise while in the NICU. These challenges follow them out of the NICU and into the home, and while being able to go home is a milestone in and of itself, there are many more milestones to overcome when it comes to feeding. “During development, the cognitive, motor, emotional and ‘state’-regulating areas of the brain organize in response to experiences. And in each of the diverse brain systems which mediate specific functions, some element of previous experience is stored.” (Perry, 1999) The infant’s early experiences (good or bad) and their responses during feeding down the road are inevitably linked. Take Nash*, an 18 month old (corrected age) who struggles to get through a meal without gagging and vomiting. Born at 30 weeks gestation, he relied on a naso-gastric (NG) tube for nutrition for 6 months, which involved the trauma of reinsertion when the tube had to be changed as well as the chronic discomfort inherent in the placement of a tube down his nose/throat. Although he began taking all of his nutrition by mouth a few months after coming home from the NICU, every bottle continued to be a battle. His past negative experiences continue to impact his feeding, and only time and continued positive associations with mealtime and eating will help him heal. In my work with infants and children with feeding disorders, the parents are the crucial actors influencing the child’s progress. The partnership that we build together allows for respectful and collaborative problem solving. It is within this partnership with parents that I discover unaddressed emotions about their child’s feeding issues that are often rooted in the early days of feeding. Whether it be from a NICU stay, necessary medical procedures, or prolonged difficulty feeding the child, it is clear that our recognition of the distress and trauma that parents endure and how that informs their feeding practices is incomplete. All parents worry. That is part of the job description. But for parents who have experienced significant and prolonged trauma around their child’s challenges, it can be debilitating in the context of the feeding relationship. Emotions, memories, and brain changes in response to the period of high stress can affect a parent’s interpretation of and response to a child’s behavior around food for years to come. Parents often continue to see their child through the lens of the previous traumatic time, and understandably have a hard time moving away from that perspective. For example, Shay* is three and is growing and thriving, but her parents still view her as incredibly fragile. Although she was born full-term, she experienced significant medical complications after birth and remained in the hospital for the better part of 6 months. They worry that she isn’t growing as quickly as she should, that she isn’t gaining weight fast enough, and that they need to push her to eat more. Her medical team often comments on her weight gain and the focus on weight versus overall development places food into battleground territory, as they feel guilty if they can’t ‘get’ Shay to eat more. The fear and stress from her earliest months continues to color their interactions with her around food, and they use pressuring feeding tactics that backfire in the end. In order for parents to help their children heal their relationship with food, they must also heal. Finding that path is something that I hope for for all of the families I work with. But first, the trauma that they have experienced must be validated and recognized. What can you do if this describes you? Make self-care a priority, so you can be your child’s best feeding partner. We hear you. We see you. Your child is a survivor and a fighter, and so are you. Beyond survival and fighting are mealtimes without anxiety and fear steering the course. 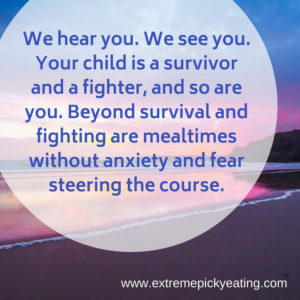 For more resources, blog posts, and information about our book Helping Your Child with Extreme Picky Eating, check out our website www.extremepickyeating.com.